So having just come into possession of a terrifyingly overgrown garden, which has triffid-like brambles, I have had my paws on the blackberries for the last few weeks. They are ripe right now, and even though it feels a little early in the year to be picking them, the strange hot/wet weather we’ve had means that they have ripened early. 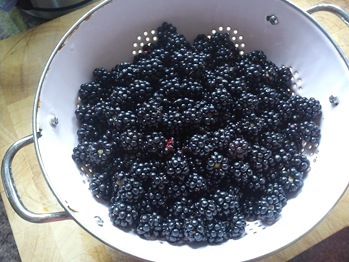 Brambles grow literally everywhere, from urban spaces to country lanes, so get out there and loot some free fruit while it lasts – it feels really satisfying to see the berries glistening beadily in the sunshine, then popping them into a tub, knowing that less tasty versions are being flogged in supermarkets for silly money. All I have done with the berries recently is make them into a sort of compote, laced with a little booze and sugar. Delicious served with thick Greek yoghurt (I use Total full fat), or draped onto scoops of vanilla ice cream. 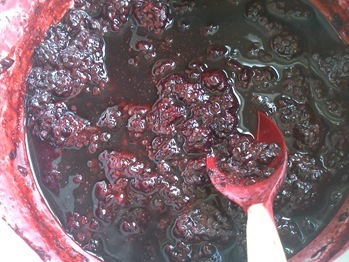 Take your blackberries and rinse well, removing all bits of twig, grit and cobweb. Let them drain for a little while in a colander. 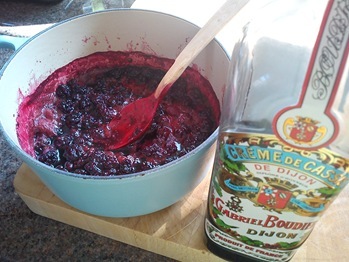 Tip into a heavy based saucepan and sprinkle over the golden caster sugar and 2 capfuls of cassis (or more, depending on how boozy you like your berries, but don’t add too much more because it will overpower the flavour of the blackberry). Simmer over a low heat for about 8 minutes, stirring occasionally, until you have a bit of bubbling up and a dark purple syrup. They are ready to go! Let them cool down. 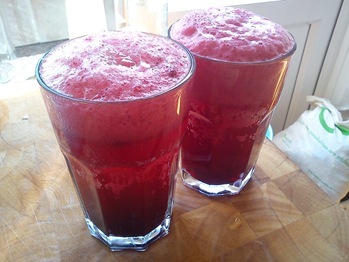 You could use the compote mixed with apple for an awesome crumble or pie, or even strain it to make ice cream (which I intend to do soon, watch this space). 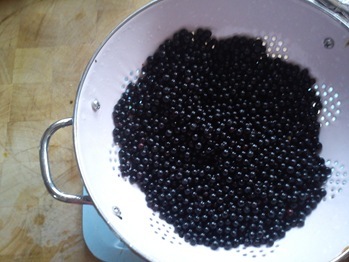 I have also foraged these elderberries – anyone got any idea what I can do with them? I hear that if you eat too many of them, they have a laxative effect! 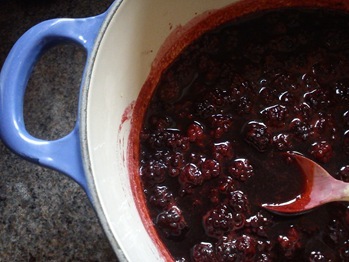 I scrumped a kilo of blackberries during the week and basically made the same compote. Instead of using Creme de Cassis I used a couple of spoons of Quince Jelly that I made in, ahem, 2009 and had never really set properly. Taking frugality to new heights. Or should that be lows? whoa! nice post. great idea dear. Hi, I'm a French cookbook author, I just discovered your blog and I love it! I might talk about it on my Facebook page. I might be coming to London soon, any places I should be going to in priority? Salut Lucie, thank you for your kind comments :o) 4 favourite places to eat in London are:Barrafina in Soho for incredible tapasMien Tay in Shoreditch East London for amazing Vietnamese foodSt John's in Archway, North London, for top quality British gastropub foodYalla Yalla in Soho for sensational Lebanese food.have a great time!